Shop No. 28/29, Moraj Residency, Plot No. 1, Sector - 16, Moraj Circle, Sanpada, Navi Mumbai - 400706, India. The Moraj Group has carved a formidable niche for itself as a trend-setter in modern and futuristic architecture in the new generation metropolis of Navi Mumbai. It has developed many a prestigious complex in and around this city of the 21st century. In fact, it is one of the most reputed Construction Companies situated here. 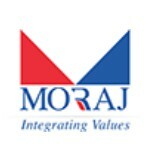 The buildings constructed by the Moraj Group are already the landmarks of the different nodes of this city.